Pernambuco  is a state in Northeast Brazil. 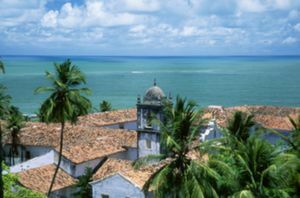 Pernambuco's main touristic attractions are in Recife (state capital), Olinda, Porto de Galinhas and Fernando de Noronha. A plethora of other cities and towns are also of touristic interest. Recife, the vibrant state capital. Caruaru, famous for forro and celebrations of the festival for São João (St. John). Jaboatão dos Guararapes, historical city, rural area, beaches, shopping and religious celebrations. Olinda, beautiful colonial town, UNESCO World Heritage Site. Fernando de Noronha. An archipelago. Besides having some of the most beautiful beaches in Brazil, Pernambuco also has a rich history (including Olinda, one of the oldest cities in Brazil, plus Portuguese, Dutch and Jewish heritage in Recife, etc.) and a strong popular culture found in its folklore, food and handicrafts. The official tourism site of Pernambuco has some detailed information (in Portuguese only) on the state. BR 101 is a main Brazilian Federal road who connects Recife with Sao Paulo, Rio de Janeiro and Salvador on the south leg; and Natal, Joao Pessoa on the north leg. The state also has BR232 and BR 408 which connects with another state cities and Campina Grande (BR408). Recife has a large international airport with daily non-stop flights to Lisbon, Madrid, Miami, almost all Brazilian state capitals; and also has seasonal charters from Frankfurt, Milan, Paris and Buenos Aires. Caruaru, Petrolina and Fernando de Noronha have regional airports. You can arrive in cruise ships at the Port of Recife  or at the Fernando de Noronha Archipelago. The cruises come from Europe (usually Lisbon and Malaga) or from the Americas (usually Miami, Buenos Aires and Santos). You can arrive in Petrolina via the Sao Francisco River. The navigable part of the river covers the states of Minas Gerais, Bahia and Pernambuco. Pernambuco has the highest murder rate of any Brazilian state, a whopping 50.7 per 100,000. Be cautious in many areas of the state. In November 2015, Brazil declared a health emergency in Pernambuco due to 646 cases of microcephaly in newborn babies. It is a possibility that microcephaly is caused by infection with the Zika virus in pregnant women. If pregnant or planning to become pregnant, take precautions to avoid mosquito bites. This page was last edited on 28 January 2016, at 15:14.